I’m out of any plates to eat on thanks to a mixup where I accidentally let a couple of drunk raccoons into my dishwasher, so this morning I decided to heat up one of my prescription microwave mescaline burritos on an old iPad I had laying around. Something happened with the microwaves and the mescaline in there, and now my iPad is getting wifi signals from the future. 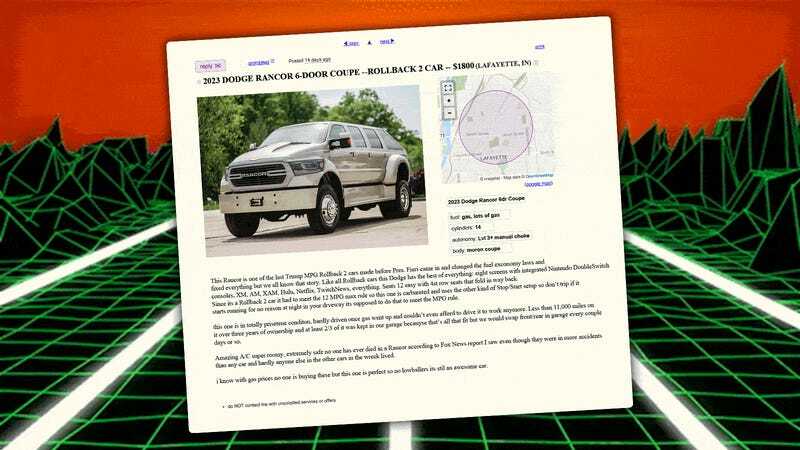 That’s where I found this ad, from Craigslist in the year 2027. From what I can gather from a bit of Nabisco-Googling (I should mention that at some point before 2027 it seems Nabisco bought Google?) the “Trump MPG Rollback” refers to the rollback of fuel economy standards we’ve just seen proposed from the Trump administration. It appears those took effect, and sometime after Trump’s strangely landslide victory in 2020 (he carried Puerto Rico, even, which isn’t even a state, even then) he enacted a second tier of fuel economy standard rollbacks for American cars, and this rollback mandated a 12 mpg fuel economy maximum. After so many years of development in the opposite way, it was actually difficult for carmakers to make cars so dramatically inefficient. It appears that Dodge, now part of Morgan (which bought FCA in 2021, thanks to some luck by Morgan’s future CEO at a Monaco craps table) was a real innovator in the area of mpg reduction, being first to introduce a V14 engine with permanent cylinder deactivation on six of the cylinders, as well as reverting to carburetion across the board and re-engineering stop-start systems to operate by turning the car on for periods of time when sensors detect that it’s been parked for over an hour. While these seem to have sold well for a couple of years, it looks like things took a real turn near the end of Trump’s second term and into the first six months of his third, at least until President Fieri and his massive following came in and, it seems, cleaned house. I haven’t had much time to really research that, but from what I can tell, the future after 2025 or so looks pretty awesome, and I really never would have believed how bitchin flames would look on the American flag if I hadn’t seen it for myself.